Ann Veronica Janssens, Hot Pink Turquoise, 2006. Vue de l’exposition Mars, IAC – Institut d'Art Contemporain, Villeurbanne, 2017 © Ann Veronica Janssens. 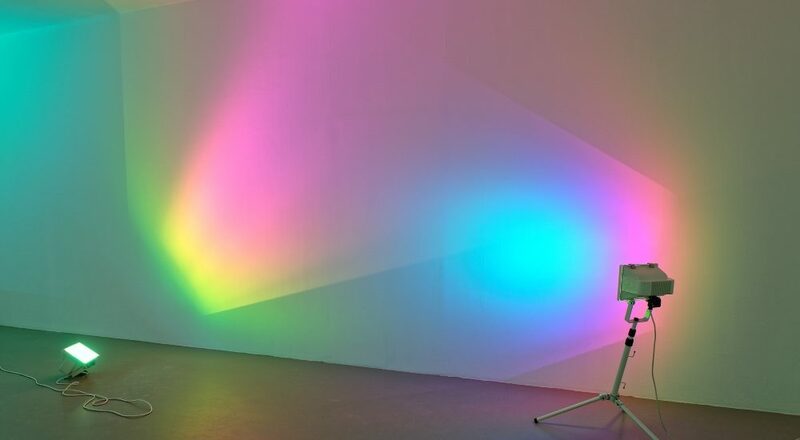 The artistic technique of Ann Veronica Janssens, a Belgian visual artist, can be defined as an exploration of the sensory experience of reality. Through various media (installations, projections, immersive environments, urban interventions, sculptures), she invites the viewer to cross into a new sensory space on the borderline of dizziness. Inspired by cognitive processes (perception, sensation, memory, representation), her works tend towards minimalism and emphasize the fleeting, ephemeral, and fragile nature of the environments she invites us to enter. To engage in a dialogue with Monet’s “Water Lilies”, the artist creates a bespoke luminous immersive environment for the Musée de l’Orangerie.